cuantas llamadas hice con ese teléfono jajajajajaja…..como adoro esta página!!!!!! Cuando yo tenía 2 años mi mamá me regaló un 24 de diciembre una especie de “central telefónica de oficina” de Fisher Price, que tenía una pizarrita donde se escribía con tiza. No había pensado eso de las “normativas para el diseño de juguetes hoy día” con razón tantas cosas bellas de nuestra infancia hoy día no existen o no las hacen similar… una pena!. Por cierto que acabo de pasar un par de días en la busqueda y compra de los juguetes de mis dos peques para éstas navidades y no veas la cantidad de pendejadas inútiles que hay a la venta. chamo!! yo tengo años leyendo y escuchando sobre esta web y no me metí hasta hoy, pero valió la pena… esos telefonitos eran lo máximo!! De pequeño tuve ese telefonito de la Fisher, así como otros juguetes similares de Fisher Price tales como el perrito, la vaquita, el estacionamiento, un proyector (electrico), en fin eran juguetes maravillosos. Algunos de ellos los conservo hoy en día (tengo 31). es increible como se han degenerado los juguetes de hoy en día, la mayoria de ellos son de verdad horribles. Vergacion!!!! Que recuerdos…. yo tuve una estacion de servicio y un avion marca Fisher Price… y ustedes recuerdan los juguetes marca TONKA? Creo que hoy dia todavia se consiguen juguetes sofisticados de esa marca en el mercado pero muy limitada por el control y precio del dolar. Yo cuando era chikito tenia uno de esos carritos !!! A ese teléfono y el perrito de Fisher Price deberían hacerles una estatua jajajaja! yo lo tenìa cuando niñita y mis padres lo vendieron, hace poco vi uno en el Mercado de los Corotos y otro en una tienda de antigüedades en el centro comercial City Market de Sabana Grande y de tonta no lo compré. 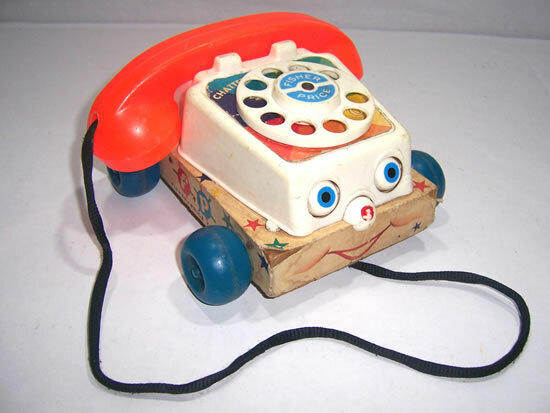 Es una reliquia además que tiene partes de madera, es hecha en los años 60s o principios de los 70s segun lei en en el telefonito, creo q despues la misma Fisher Price hizo una imitación de ese telefonito pero 100% plástico. Hey – nice weblog, just looking about some blogs, seems a quite good platform you’re making use of. I’m currently utilizing WordPress for a couple of of my websites but looking to change 1 of them around to a platform similar to yours as a trial run. Something in specific you would recommend about it? I’m happy I found this blog, I couldnt learn any info on this topic matter prior to. I also run a site and if you want to ever serious in a little bit of guest writing for me if feasible feel free to let me know, i’m always appear for people to check out my site. Please stop by and leave a comment sometime! Resources this kind of as the 1 you mentioned here will be incredibly helpful to myself! I’ll publish a hyperlink to this web page on my personal weblog. I’m certain my site site visitors will find that very helpful. I thought it was going to be some boring aged submit, however it definitely compensated for my time. I’ll submit a hyperlink to this page on my weblog. I’m certain my visitors will come across that incredibly useful. Dude, please tell me that youre heading to write a lot more. I notice you havent written another blog for a while (Im just catching up myself). Your weblog is just as well important to be missed. Youve acquired so much to say, this kind of knowledge about this subject it would be a shame to see this weblog disappear. The internet needs you, man! Thanks for taking the time to discuss this, I really feel strongly about it and appreciate mastering much more on this topic. If possible, as you gain experience, would you thoughts updating your weblog with extra data? It’s very helpful for me. I admire the beneficial details you offer in your content. I’ll bookmark your blog and also have my kids examine up right here frequently. I am very certain they will discover lots of new things right here than anyone else! Your answer shows real itnellginece. Thank you for an additional excellent post. Exactly where else could anybody get that kind of info in such a perfect way of writing? I’ve a presentation subsequent week, and I am to the appear for such facts. I’m happy I found this blog, I couldnt discover any data on this subject matter prior to. I also run a site and if you want to ever serious in a little bit of guest writing for me if feasible really feel free to let me know, i’m always look for people to verify out my site. Please stop by and leave a comment sometime! I thought it was going to be some dull previous submit, however it definitely compensated for my time. I will submit a website link to this page on my blog. I am sure my visitors will discover that extremely useful. Thank you for that smart critique. Me & my neighbour were preparing to do some research about that. We got a great book on that matter from our local library and most books where not as influensive as your facts. I’m pretty glad to see such information which I was searching for a long time. What I wouldnt give to have a debate with you about this. You just say so many things that come from nowhere that Im pretty sure Id have a fair shot. Your weblog is fantastic visually, I mean people wont be bored. But others who can see past the videos and the layout wont be so impressed together with your generic understanding of this subject. I would wish to thank you for that efforts you might have created in writing this write-up. I’m hoping the same best work from you in the future as well. In reality your creative writing skills has inspired me to start my own BlogEngine blog now. Took me time to read all the comments, but I truly enjoyed the post. It proved to be Quite helpful to me and I’m certain to all the commenters here It’s always nice when you can not only be informed, but also entertained I’m positive you had fun writing this article. Hey – nice weblog, just looking around some blogs, appears a pretty good platform you’re making use of. I’m presently making use of WordPress for a few of my web sites but looking to alter 1 of them about to a platform similar to yours like a trial run. Anything in specific you’d suggest about it? I want to thank you for the efforts you have contributed in composing this blog post. I am hoping the same high-grade blogpost from you in the future as well. In fact your creative writing abilities has inspired me to get my own blog now. Truly the blogging is spreading its wings rapidly. Your write up is a good model of it. What I wouldnt give to have a debate with you about this. You just say so many things that arrive from nowhere that Im fairly certain Id have a fair shot. Your blog is terrific visually, I mean people wont be bored. But others who can see past the videos and the layout wont be so impressed with your generic understanding of this subject. Resources these as the 1 you mentioned right here will be incredibly helpful to myself! I will publish a hyperlink to this page on my particular blog. I’m certain my site site visitors will locate that quite effective. Good to see real expertise on display. Your contriubtoin is most welcome. Thank you for that wise critique. Me & my neighbour were preparing to do some research about that. We acquired a beneficial book on that matter from our local library and most books exactly where not as influensive as your facts. I am very glad to see such information and facts which I was searching for a long time. An awesome share, I just given this onto a co-worker who was doing a little research on that. And he in fact bought me lunch because I discovered it for him… smile.. So let me rephrase that: Thankx for the treat! But yeah Thnkx for spending the time to discuss this, I feel strongly about it and love reading more on this topic. If possible, as you gain expertise, would you mind updating your blog with more details? It is extremely helpful for me. Two thumb up for this blog! Good to become browsing your weblog again, it has been months for me. Nicely this post that i’ve been waited for so lengthy. I will need this post to complete my assignment in the college, and it has exact same subject with your post. Thanks, excellent share. I have read a couple of the posts on your website recently, and I absolutely enjoy your style of blogging. I added it to my favorites website list and will be checking back soon. If you have a few moments, please visit my site and let me hear your thoughts. Ive been meaning to read this and just never got a chance. Its an issue that Im incredibly interested in, I just started reading and Im glad I did. Youre a wonderful blogger, 1 of the finest that Ive seen. This weblog unquestionably has some info on topic that I just wasnt aware of. Thanks for bringing this things to light. I’m impressed, I have to say. Very rarely do I discovered a blog that’s both informative and entertaining, and let me tell you, you have hit the nail on the head. Your article is outstanding; the matter is something that not enough people are speaking intelligently about. I’m very happy that I stumbled across this in my search for something relating to this. delivers a realistic look at the situation. information, i really like finding articles that educational effective in nature. published a realistic look at the topic. perception, i really like finding articles that revealing worthwhile in nature. Informative post, this is. It is actually great to find a article that is useful. Good to be visiting your weblog again, it has been months for me. Nicely this write-up that i’ve been waited for so lengthy. I want this article to total my assignment inside the college, and it has exact same topic with your post. Thanks, great share. gives you a realistic look at the situation. for one am glad, i really like finding views that educational worthwhile anyway. I wanted to say thanks to you for this excellent read!! I have you bookmarked to view fresh stuff you post. facts the reality of the topic. outstanding post, It is nice to see views that enlightening effective in nature. An astonishing blogpost, I just given this onto a friend who was doing a little research on this. And he in fact bought me lunch because I found it for him… smile. So let me reword that: Thnkx for the treat! But yeah Thnkx for spending the time to talk about this, I feel strongly about it and love learning more on this topic. If possible, as you become expertise, would you mind updating your blog with more details? It is extremely helpful for me. Big thumb up for this blogpost! Had to sort through a lot of comments, however I definitely got a lot out of your article. It proved to be very helpful for me and I am sure to all the commenters here! I find it to be quite particularly good when you can not only be informed, but also entertained! I’m sure you had a good time researching this post. Thankx so much for this! I havent been this thrilled by a blog for a long period of time! You have got it, whatever that means in blogging. Well, You are certainly someone that has something to say that people should hear. Keep up the good work. Keep on inspiring the people! Damn, cool website. I came across this on Yahoo, and I am extremely happy that I did. I will definately be returning here more regularly. Wish I could add to the post and bring a bit more to the post, but am just reading as much info as I can at the moment. In no way the quickest web site to load however I’m glad I waited. Having searched most of the evening for this kind of material I finally found it on your web page. One delighted reader here! Damn, awesome site. I came across this on Google, and I am happy that I did. I will definately be revisiting here more regularly. Wish I could add to the post and bring a bit more to the post, but am just absorbing as much info as I can at the moment. Hello.This post was extremely remarkable, particularly because I was looking for thoughts on this topic last Tuesday. Well I really liked studying it. This post provided by you is very effective for accurate planning. Great blog you have here. So many websites like this cover subjects that just aren’t covered by magazines. I don’t know how we got on 12 years ago with just newspapers and magazines. I have been meaning to publish about something similar to this on my website which provided an idea. Cheers. That was an excellent blog. You made some great points and I appreciate for your insight! Take care! I am taking a look ahead for your next post, I’ll attempt to get the hang of it!